While double chins are adorable on babies, as an adult, you might not find yours as endearing. At Body Contourz body image center in Studio City, California, the team can help you get rid of your under-chin fat with state-of-the-art, nonsurgical chin sculpting procedures. They offer the revolutionary UltraSlim® light therapy system to reduce fat and sculpt your chin without surgery, downtime, or side effects. To learn more about chin sculpting with immediate results through UltraSlim technology, call the office or request an appointment using the online booking tool. What is UltraSlim light therapy? UltraSlim is a revolutionary light therapy that helps you lose fat and contour those hard-to-sculpt areas of your body, including a double or sagging chin. Using red light energy and your body’s natural detoxification process, UltraSlim destroys fat cells and creates tighter, younger-looking skin. The light therapy stimulates your body’s collagen and elastin production so your skin gets tighter naturally. And, because it works below the surface of your skin without the use of heat or freezing temperatures, UltraSlim is safe and painless. There’s no damage to the surface of your skin; the light energy affects only the fat cells. How does UltraSlim sculpt my chin? UltraSlim chin sculpting is a noninvasive face-lift treatment. The procedure can take 10-15 years off the appearance of your face in just two weeks. The FDA-approved device never comes in contact with your skin and uses gentle light energy to reduce fat cells, tighten the skin under your jaw and along your neckline, and improve the appearance of a double or sagging chin. The team at Body Contourz creates a customized treatment plan to help you slim down your chin for a smoother, more defined profile. Once you achieve the results you desire, monthly touch-ups can keep your chin sculpted and younger-looking long term. How safe is UltraSlim light therapy? UltraSlim technology is the safest fat-reduction, body sculpting treatment available today. Since it doesn’t use heat, cold, ultrasound, radiofrequency, or laser energy to kill fat cells, there are no side effects or pain. UltraSlim is so safe that it’s the only fat-reduction system in the safest category of medical devices – the same classification as tongue depressors! That’s how little risk is involved in UltraSlim chin sculpting treatments. Who is a good candidate for chin sculpting treatments? 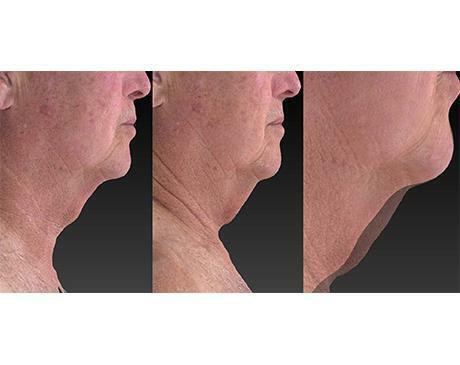 With UltraSlim, nearly anyone who wants to reduce fat and tighten the skin under their chin without surgery or downtime is a good candidate for chin-sculpting treatments. Whether you have several pounds to lose or you just want to eliminate fat and tighten that excess skin under your chin, you may benefit from UltraSlim. Call the Studio City office today, or request an appointment online to take advantage of permanent fat-reduction and body-sculpting treatments.